This is Maximus, a beautiful, cheeky, 4-year-old Shih Tzu / Chihuahua cross (ShiChi). 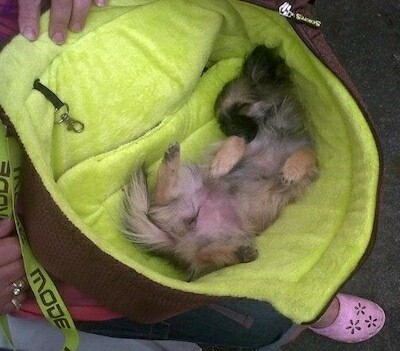 The ShiChi is not a purebred dog. 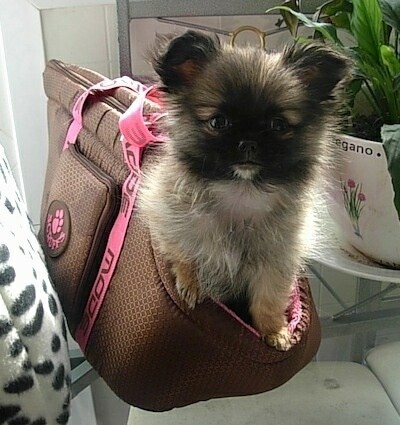 It is a cross between the Chihuahua and the Shih Tzu. The best way to determine the temperament of a mixed breed is to look up all breeds in the cross and know you can get any combination of any of the characteristics found in either breed. Not all of these designer hybrid dogs being bred are 50% purebred to 50% purebred. It is very common for breeders to breed multi-generation crosses. Ellie Mae the Shi-Chi puppy at 4 months old—"This is my sweetheart Ellie Mae McKinney. 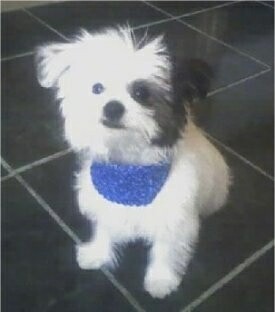 She was born and raised in our home by our other Shi-Chi, Daisey McKinney. 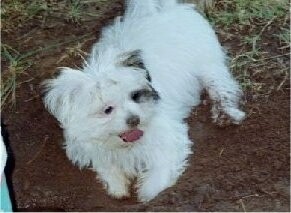 Her father was a full-blooded Shih Tzu from a friend of ours. Both of the parents were blonde, which confuses us on how she is white and brindle. Ellie is our sweetie of the house who can be very shy at times, but is completely full of love when she gets used to you." "Henny is a 6 week old Shi Chi puppy. Her mother is a Chihuahua and father is a Shih Tzu. 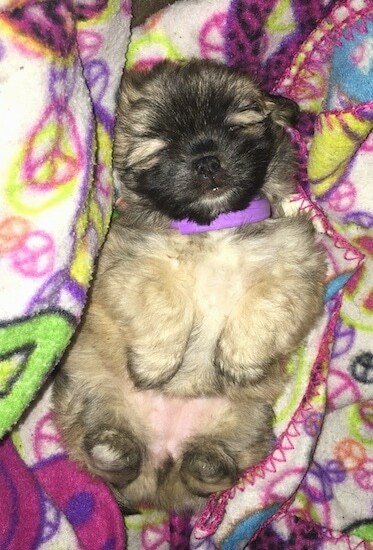 In the picture she was sleeping after just getting a bath." Lulu Bluebell the Shi Chi as a puppy at 5 months old—"Lulu is a sweet little girl with the nicest nature and loves everyone. 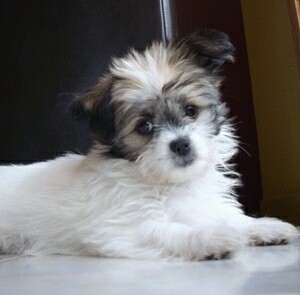 Her mommy is a Shih Tzu and her daddy is a longhaired Chihuahua. 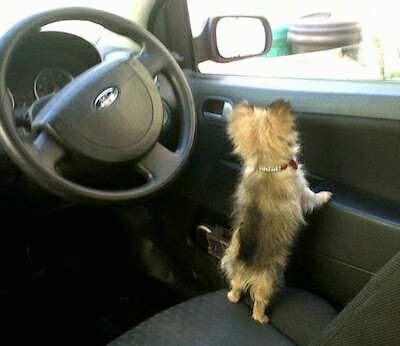 She loves to go everywhere with me and everyone stops to fuss over her as she is so striking and adorable." 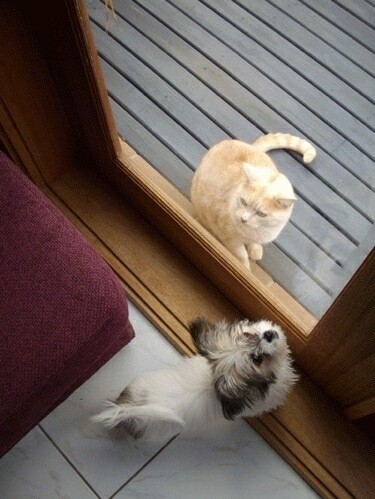 "Bonny is our first dog, so we are new to dogs, as is our cat Laramie. 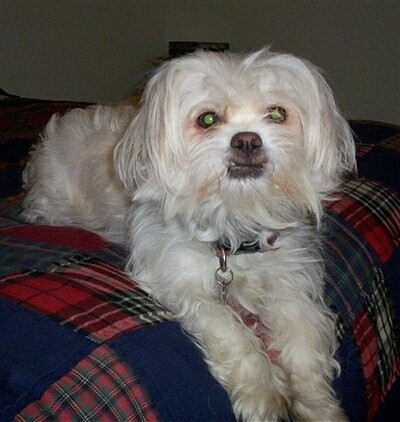 Bonny's parents were surrendered to the pound after an unplanned pregnancy. We travelled 11 hours by car just to see her and instantly fell in love. Bonny is the middle pup of 2 brothers, Max and Jack. Her mum is a longhaired Chihuahua and dad a Shih Tzu. We have begun to train Bonny using tips from a Cesar Millan DVD and subscribe to his online sessions; this helps us out every time we need advice. 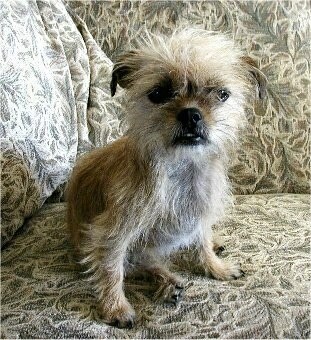 Thanks to Dog Breed Info Center I could see what Bonny might look like before she was adopted. Bonny's parents and siblings have been re-homed thanks to Pet Rescue Australia." ShiChi puppies Darla and Butch at 4 months old—"They have blue eyes and great personalities. Darla is a lovable, cuddling cutie and Butch (the white one) is bigger and loves to wrestle and play catch with his toys." 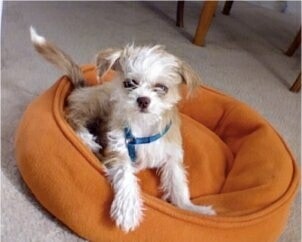 Missy, a one-year-old ShiChi—her mother was a small, tan Chihuahua and her father was a small Shih Tzu. Missy is five pounds and always looks like she is having a bad hair day! 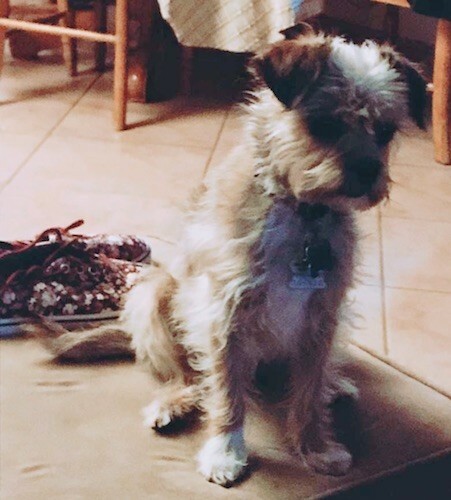 Max the ShiChi puppy at 14 months old (Chihuahua / Shih Tzu mix)—"At 18 months Max weighs a whopping 7 pounds, but makes up for his small size with his huge energy. He is a very gentle dog and rarely barks. His mom is a longhair Chihuahua and dad is a Shih Tzu. The unusual things about Max are his long legs, which makes jumping over things a synch." "This is Mitzy. She is a Shichi and she is the best pupper. She doesn't bark. She is calm and smart and is very well trained." Sami the ShiChi at 3 years old—"She is the spunkiest dog I have ever had and I attribute that to the Chihuahua in her. I have owned Shih-Tzus in the past and they were never this personality-plus!!!" Destiny the ShiChi puppy at 4 weeks old—"Her mom is a black and white 8-lb. Shih Tzu, and her dad is a 5-lb. longhaired red Chihuahua." Destiny the ShiChi puppy at 8 weeks old and 2 pounds—"She is full of energy, she loves attention and loves to play." 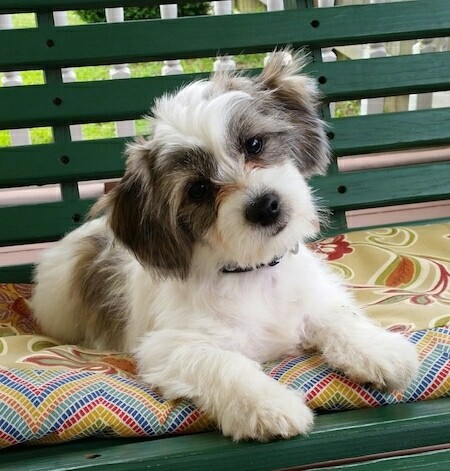 "Bodhi the ShiChi at about four and a half months old—her dad is a black and white Shih Tzu; her mom a black and tan Chihuahua. Her eyes are green now, but were blue when she was very little. She weighs about five pounds here."